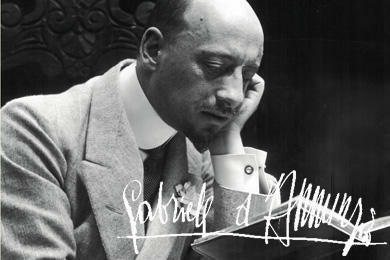 The name of Gabriele d’Annunzio does not perhaps hang on everybody’s lips – and yet he was a fascinating Italian who was both deplorable and charismatic. As such, he was worthy of the eight years that Lucy spent researching his life for her multi-award winning biography. In her riveting talk on February 6th, Lucy fleshed out his extraordinary life as a poet, playwright, early pioneer of aviation, army officer, rabid nationalist – and who, through bragging and bluster, forged an international reputation for notoriety. He was also a major poet-seducer of women on a par with Lord Byron and many of his conquests were driven to despair and insanity following their inevitable rejection. From an early age, Lucy told us, d’Annunzio was a prolific writer, publishing his first series of poems at the age of 16. However, his talent for self-promotion was evident the following year - just as an expanded second edition was about to be published – when a newspaper in Florence received a postcard saying d’Annunzio had fallen off his horse and died. The news was reported all over Italy, but it was not remotely true – it turned out that d’Annunzio has sent the postcard himself. It was the start of an extraordinary career, writing more poetry, journalism and novels, as well as spending extravagantly (his father was a landowning wine merchant). He had a love of exotic interior design, regardless of whether he could afford it, and his writing co-existed with his relentless thrill-seeking, such as horse-rising, fox-hunting, flying – and the determined pursuit of women. 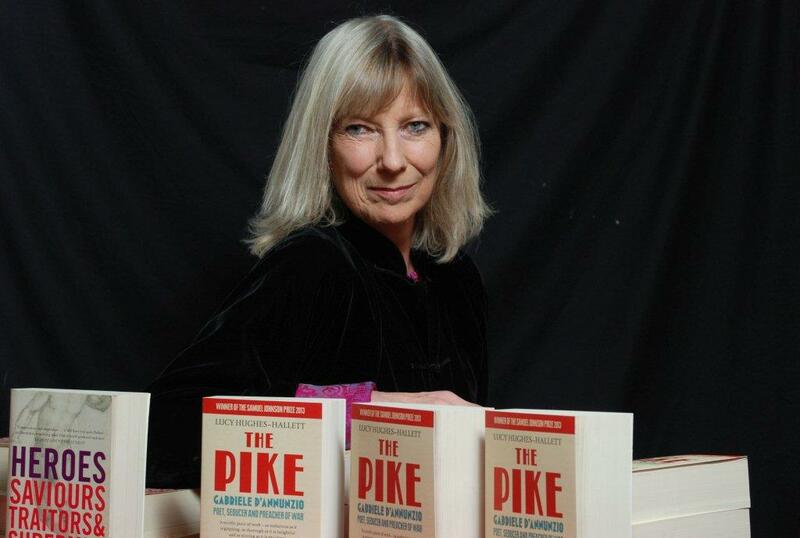 By all accounts, he was not conventionally good-looking, with one description of him as a “frightful gnome with red-rimmed eyes, no eye-lashes, no hair, greenish teeth and bad breath” – but countless women found his voice irresistible, said Lucy. As a measure of his daring-do, d’Annunzio took off from Venice in May 1915 on board a plane bound for Trieste – then still part of the Austro-Hungarian empire – with a young pilot and a cargo of bombs of propaganda. They came under fire near Trieste and d’Annunzio dropped bombs on Austrian submarines, as well as pamphlets he had written himself. One of the bombs even became stuck but – somehow – d’Annunzio managed to push it overboard and he returned home in triumph, setting out in a new role as a national hero. Italy declared war on Austro-Hungary in May 1915 and the following three years of slaughter did nothing to dent his enthusiasm for war. 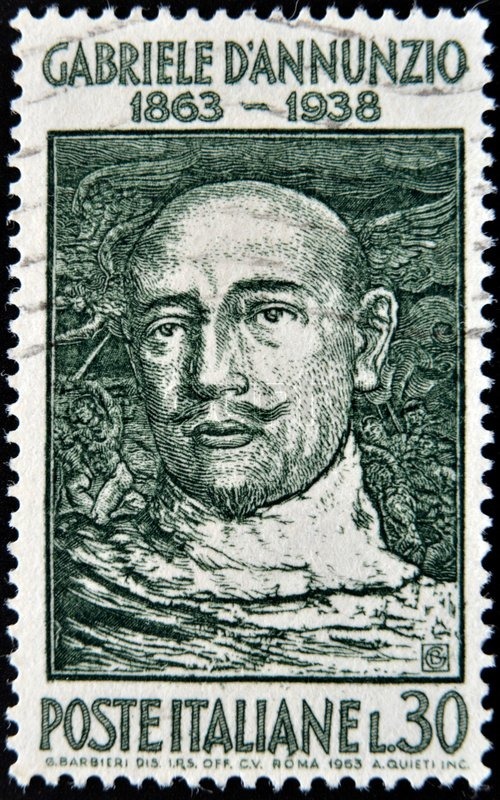 D’Annunzio lost many friends, as well as an eye when his plane was shot down, but after the armistice, Lucy told us how he led a small rag-tag army of irregulars and mutineers into the disputed city of Fiume – and set himself up as its dictator. He reigned for 15 months as its “Duce”, until the Italian navy forced him out. In 1921, d’Annunzio moved to a stylish villa above Lake Garda, living as a semi-recluse in a house designed as his personal shine, largely funded by the Fascist government to keep him out of the way – and he was still immersed in the pursuit of cocaine, interior design and women until his death in 1924. 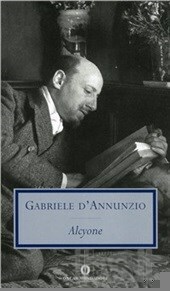 Few of d’Annunzio’s books are read widely today and he is largely forgotten, even in Italy, but, even though it may be hard to admire him, Lucy suggested that he was still an extraordinary man.